Sawadee ka! 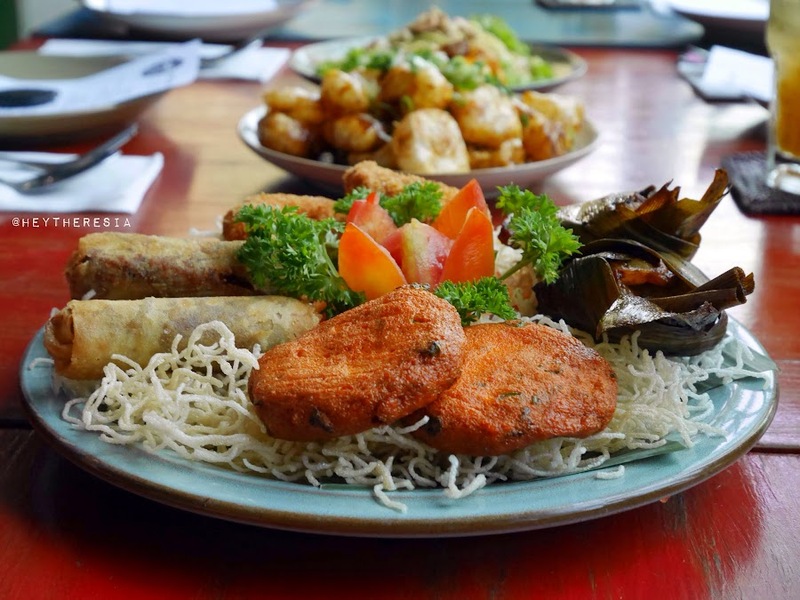 Looking for an authentic Thai cuisine in Jakarta? 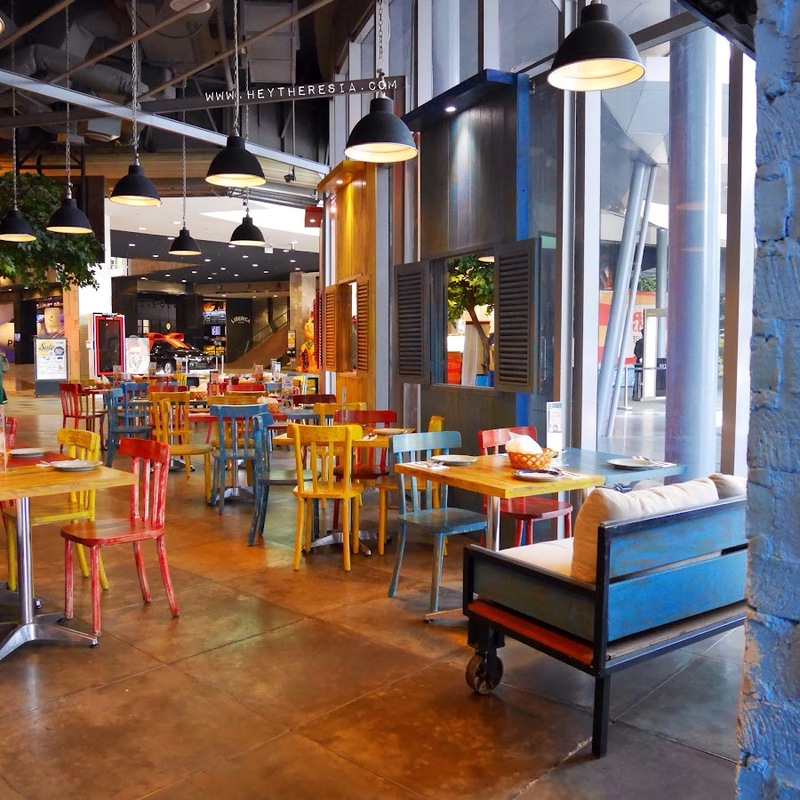 Here at Thai Alley they serve Thai delicacy from appetizing salad to sweet desserts. 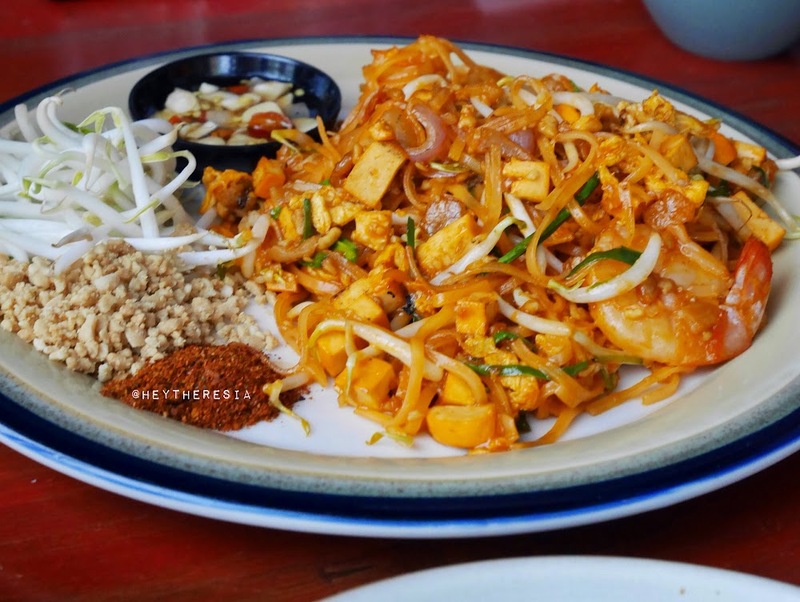 Real food with selected daily ingredients, and of course real Thai Chefs. 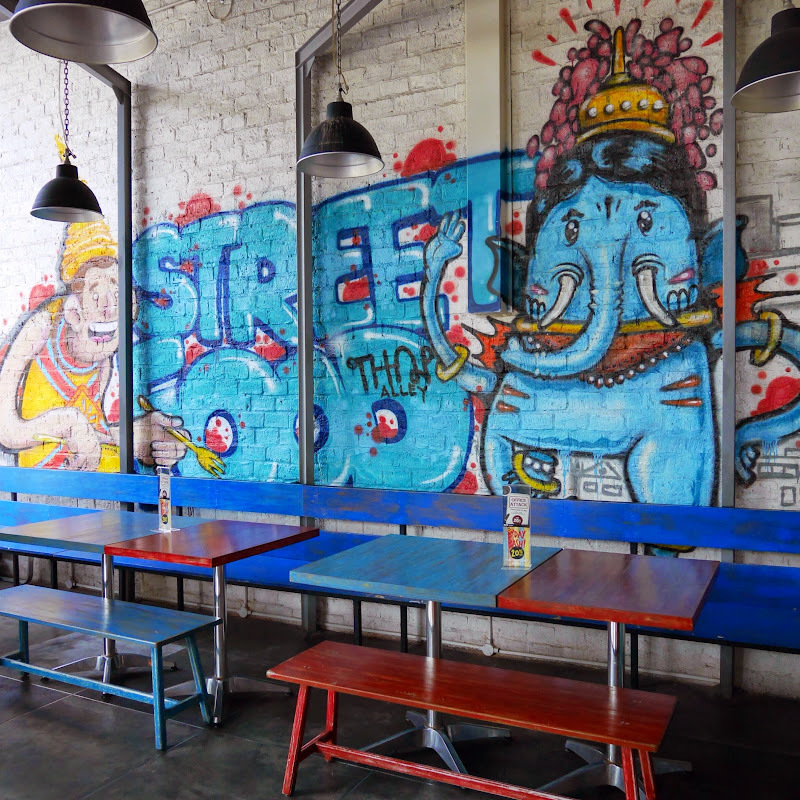 The interior of Thai alley is more likely street style with colorful gravity, wooden chairs and tables, and oh I love their blue table, it's personal favorite. 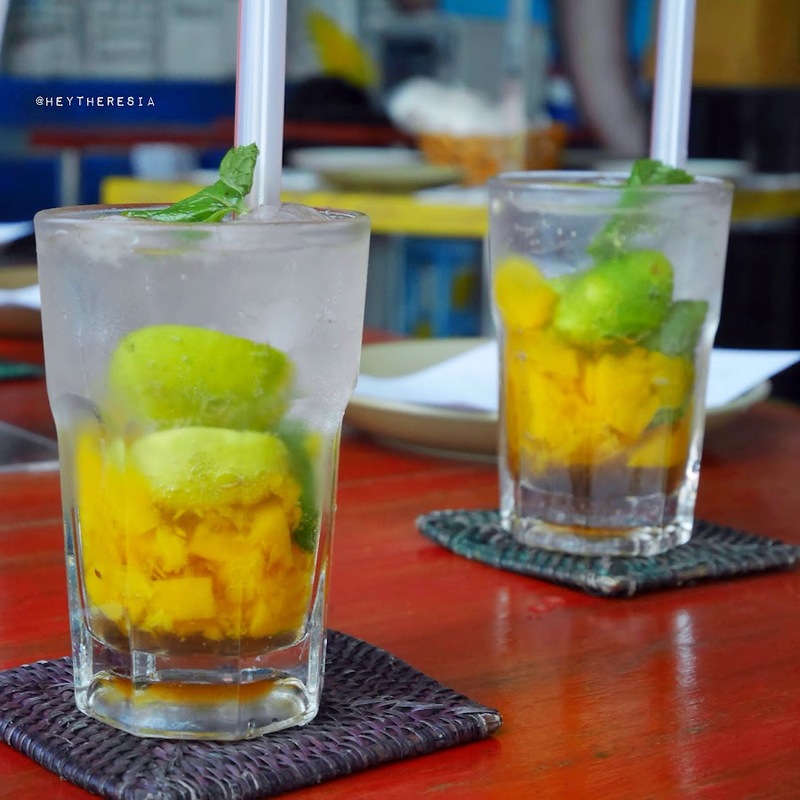 As a welcome drink, I had a glass of refreshing minty peach squash called Rayong (IDR 45.000). It contains peach chunks along with the lime juice, mint leaves, lavender syrup, and soda. 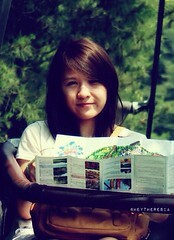 It's not too sweet, really suits to my taste. 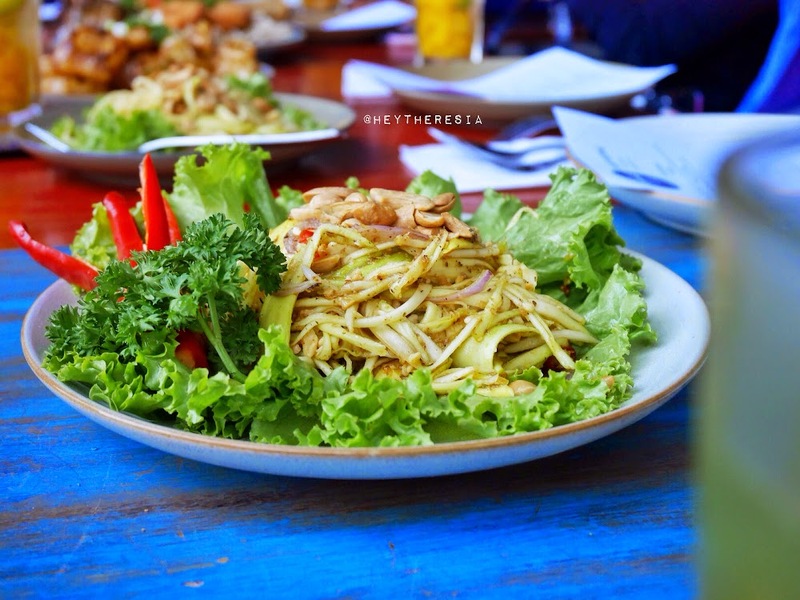 Yam Mamuang (IDR 45.000) is a spicy mango salad. Shredded mango with tangy chili lime dressing topped with roasted cashew nuts. I love spicy food, and this salad is more than just spicy but so refreshing. Thai Staters will be on Thai Alley menu next week. Yes it's new but actually it's a set of few appetizers that already on the current menu, those are Tod Man Pla (Thai fishcakes), Tod Man Goong (Thai Prawn Cake), Gai Hor Bai Toey (marinated chicken in pandanus leaf), and Poh Pia Tod, it is a deep fried spring rolls filled with minced chicken, glass noodles, and peanuts, it's closely like Singaporean Popiah but deep fried. Nang Krob Pad Heng (IDR 48.000) is a crispy beef skin crackers with tom yam paste. Crispy deep fried beef skin coated with sweet glaze, yes it's actually not sour but you still can taste the tangy tom yam flavor. I can see that it was the most favorite appetizer on our lunch that day. It's everyone's favorite but it was too greasy for me. Pad Thai (IDR 59.000) stir fried rice noodles with shrimps, eggs, tomatoes, bean sprouts, and chives. 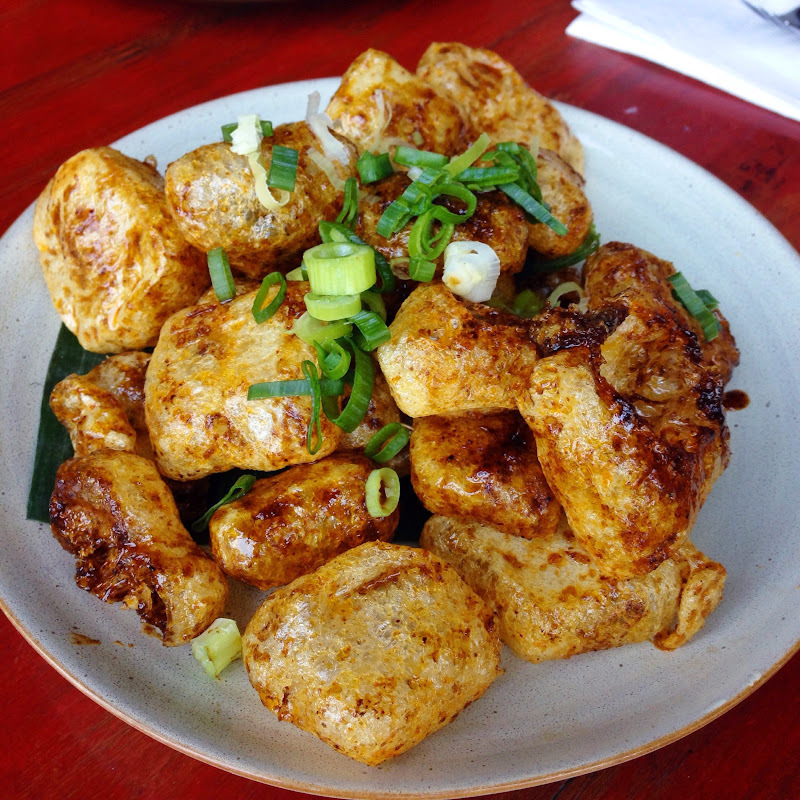 It served with chili powder, toasted peanut chunks, and more bean sprouts. 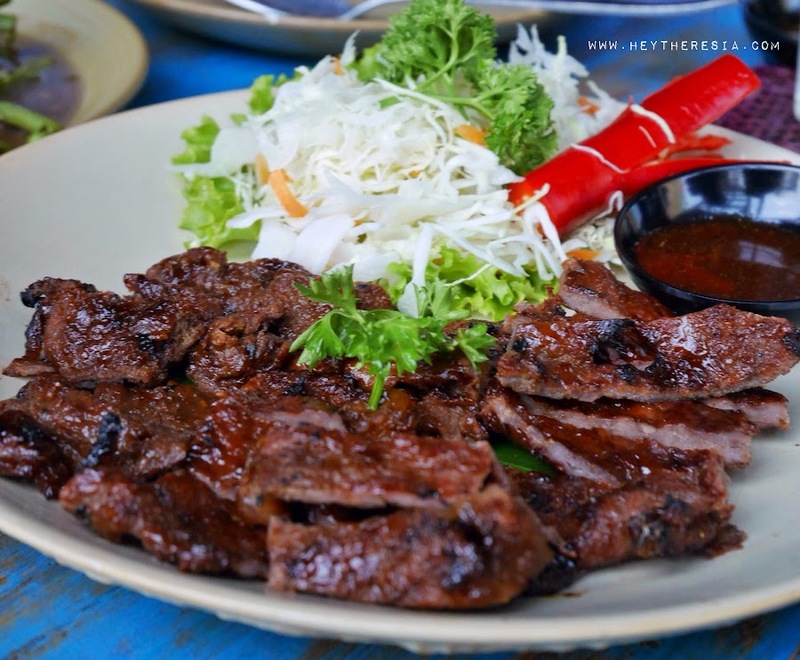 Neua Yang (IDR 108.000) is a charcoal grilled Australian rib eye, seasoned with thai herbs served with spicy sauce. The beef was well marinated, sweet, smoky, and tender. 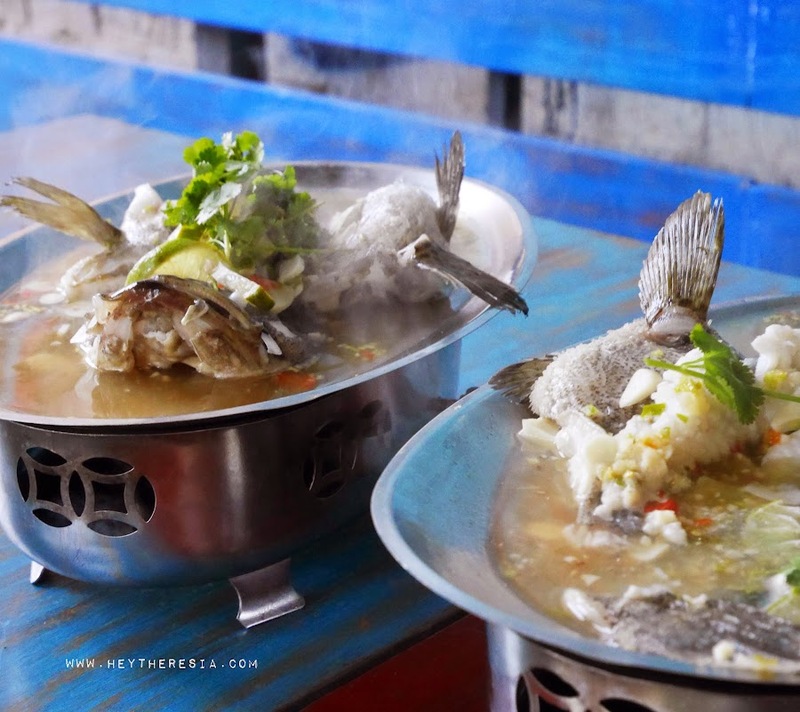 Pla Garupa Manaow (IDR 279.000) is a steamed grouper fish with fresh lime juice and chili. This dish has clear soup but surprisingly it's actually has stronger taste compared to Tom Yam. It's sour, slightly spicy, with dense aroma of cilantro. I'm telling you, it will make your eyes wide open. I am not really into steamed fish dish but I really can enjoy this dish. 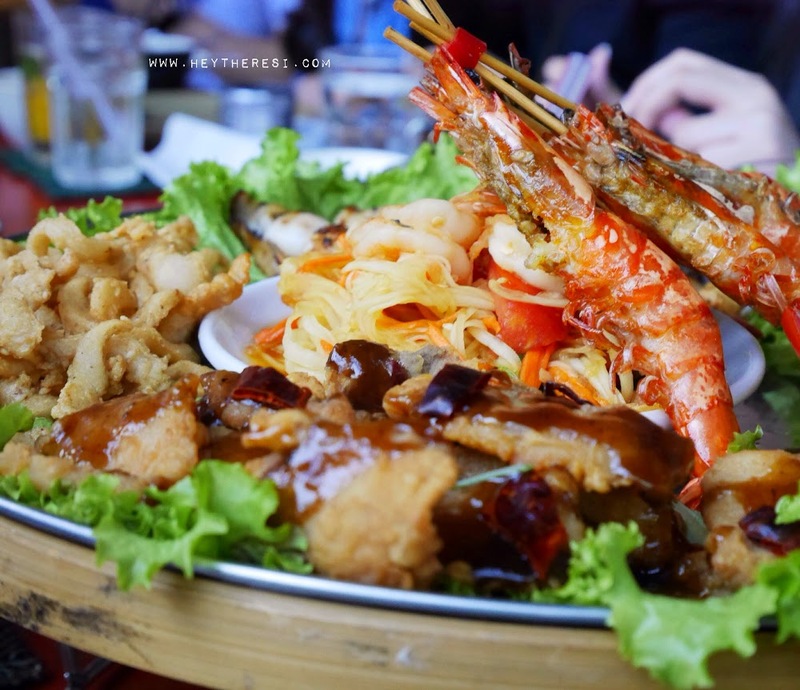 Seafood Platter contains grilled and fried fresh seafood, from squid, prawn, mussels, to fish. It served with Thai dipping sauce and Som Tam (spicy papaya salad). Asian desserts are always be my personal favorite, and so with Thai desserts. 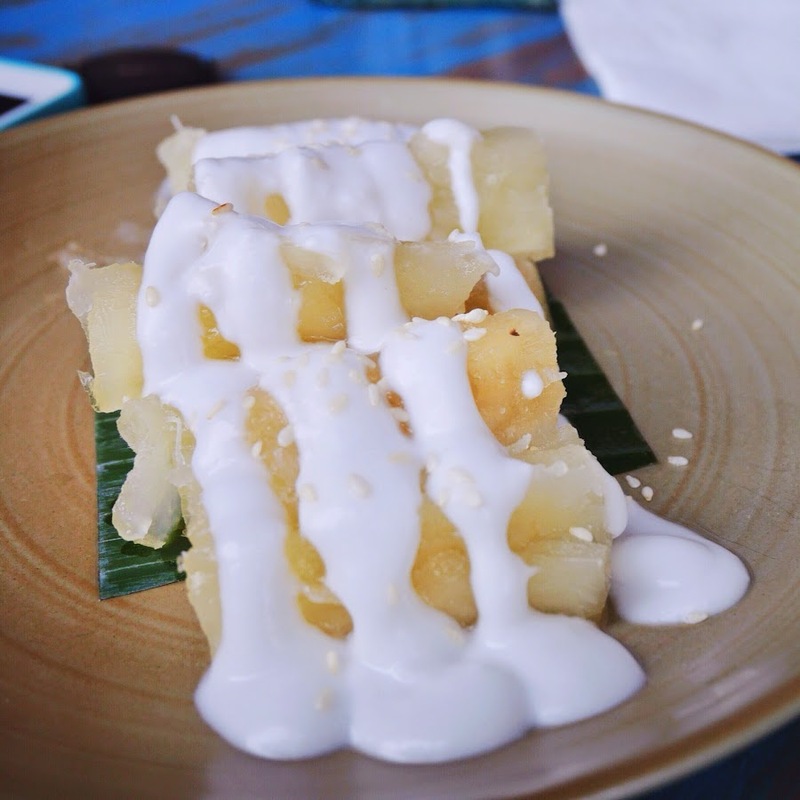 Man Cham (IDR 42.000) sweet tapioca (cassava) topped with coconut cream. It was simply yummy. 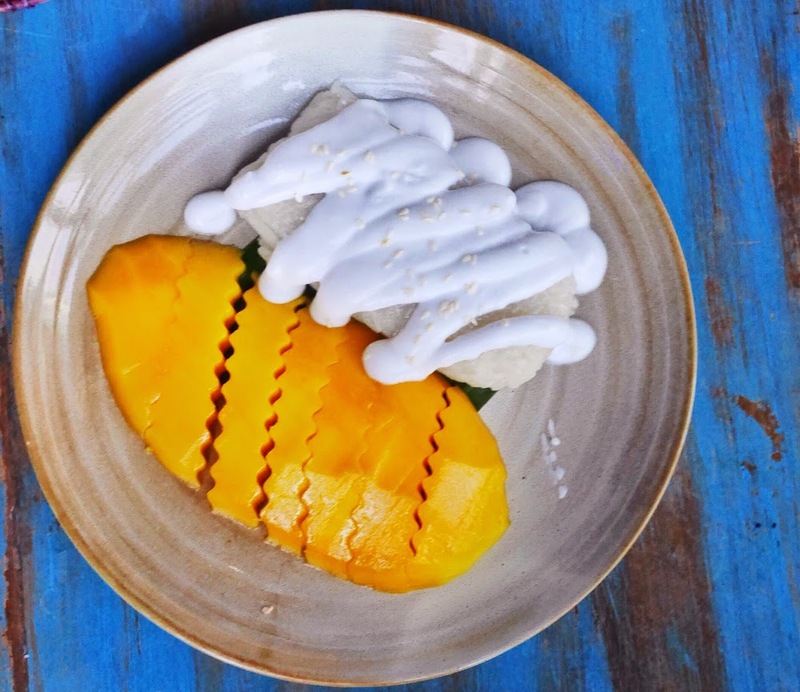 Khao Niew Mamuang (IDR 49.000) Thai Mango and sweet organic glutinous rice with coconut cream on top. I can say this is the most popular Thai dessert. The mango was fresh, sweet, and juicy.